Last Judgment scenes are fascinating. They follow a distinct pattern: Christ in a position of judgment with some people being assigned to Heaven, others to Hell. Beyond that, though, there are a number of slight, but significant, variations. This week, I’m taking a closer look at the one by Hans Memling. Here, Christ is enthroned on a rainbow, his feet resting on a sphere that represents the world. He is surrounded by Mary and John the Baptist (who represent the initiation of the plan of salvation) and the twelve disciples (who spread the gospel of salvation). Four angels hover above with the symbols of Christ’s passion (thus instruments in salvation): the pillar, the cross, the crown of thorns, and the nails and spear. The lily and the sword represent innocence and guilt, respectively, and they seem to be emanating from Christ mouth which suggests that he is proclaiming judgment on the poor souls below. Immediately below Christ is Saint Michael, the archangel. By the Renaissance, he had become Christ’s right-hand man for Judgment Day. As people emerge from their graves to face judgment, he weighs them on a scale. If their souls are deemed pure, they are welcomed into heaven by Saint Peter (the one holding the key). If their souls are still marked by sin, demons drag them off to hell where they are tortured. The contrast between the calmness of the left side and the chaos of the right is important. 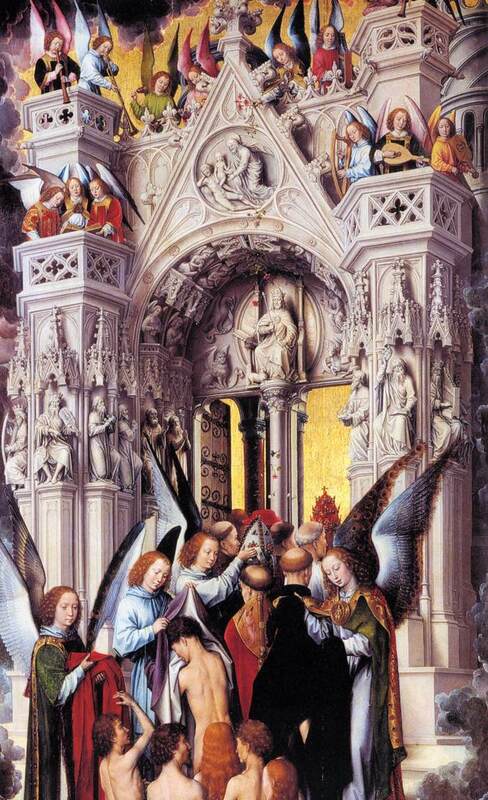 The men and women being ushered into heaven are very orderly, even as a few turn to witness an angel confront a demon who is trying to steal a soul away. The onlookers barely register alarm as they wait their turn to climb the steps to the pearly gates. But on the other side, it’s all commotion. The demons prod and whip the Damned, forcing the crowd into the fiery mouth of Hell. Unlike the upright bodies of the Saved on the left, the bodies of the Damned flail and twist and tumble. It’s horrifying. 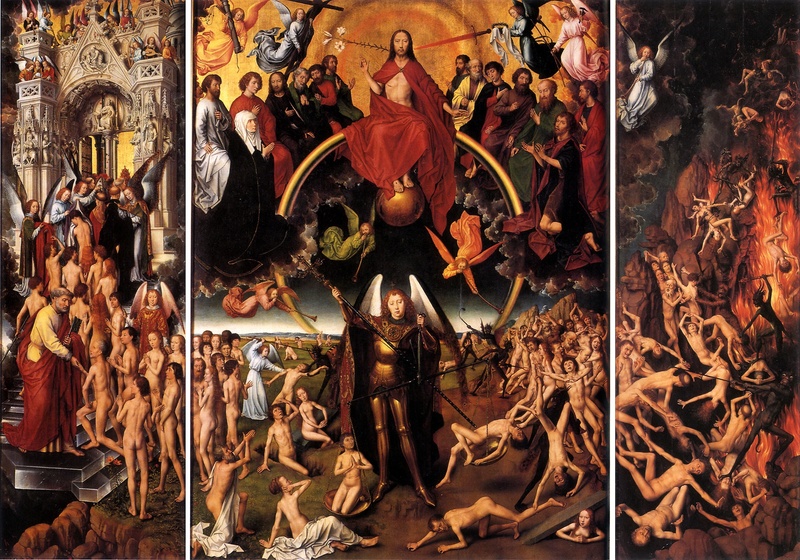 Other artists take similar approaches to depicting the Last Judgment, but Memling includes a couple details that touch me. First, in the crowd of the Damned, there are a few figures who are reaching up to the saints above, pleading for help. Is it just too late for them? Memling seems to be telling his audience that they need to repent and believe now. You can’t wait until you’re feeling the flames of Hell to finally come to Jesus. It doesn’t work that way. But my favorite part of this painting is on the other side. As the Saved climb the stairs they are greeted by a group of angels who offer them new clothes. They aren’t just new shirts and dresses, however, they are actually vestments. These souls are being dressed for worship. As far as I know, this is the only depiction of the Last Judgment that emphasizes the eternal worship of God in Heaven. Perpetual torture by demons or never-ending worship with the angels? Hmmm … tough choice.